Provides recipes for salads, pastas, meat, fish, breads, and desserts that emphasize fresh ingredients and a minimum of fuss, and includes a section on getting children involved in cooking. 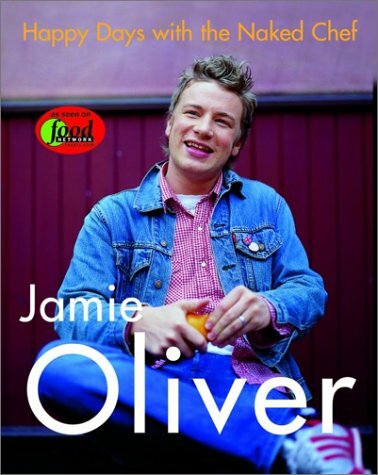 Amazon.com description: Product Description: Jamie Oliver believes in finding the best ingredients and making tasty, easy, social meals. Like his first two bestselling cookbooks, Happy Days with the Naked Chef is filled with fantastic salads, pastas, meat, fish, breads, and desserts for all occasions. In 'Comfort Grub' Jamie gives you his contemporary twists on old favorites, and in 'Quick Fixes' he whips up really delicious, easy dinners--just right for when you get home late from work. The 'Kids' Club' chapter is all about involving your kids in your cooking, like having them squash fresh tomatoes for pasta, pit olives, and knead and shape bread. For Jamie Oliver, food is all about Happy Days--good fun and great eating.